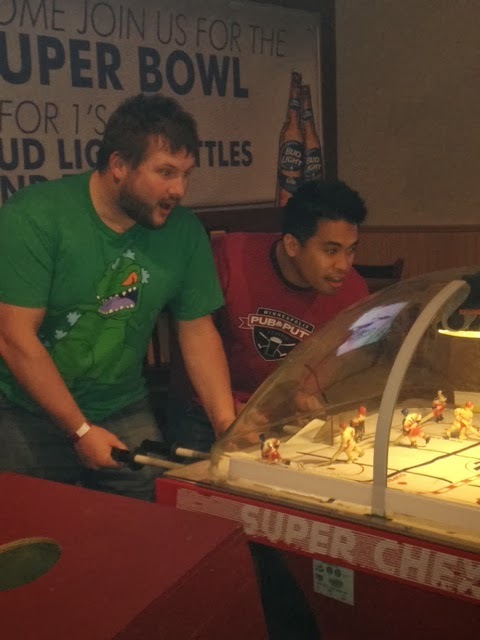 MN Twin Cities WAKA Kickball: Gauntlet of Bar Games Week 1: Super Bowl Trivia! Gauntlet of Bar Games Week 1: Super Bowl Trivia! Opening week of the 2014 Gauntlet had three teams compete in Super Bowl Trivia. Unfortunately, Joline's Team won with 21 points! Congrats to the winning team. Second place was Vodka Red Balls, who also prepped for future gauntlet games by playing darts and shuffle board. Third place team, Shots for Everyone, also practiced for future gauntlets playing some skeeball, flip cup, and hockey. Next week will be a Twister Tournament, so start stretching! Jackie and Joline encourage you to add a few more players to your team! Registration is open for more teams to sign up through February 11.